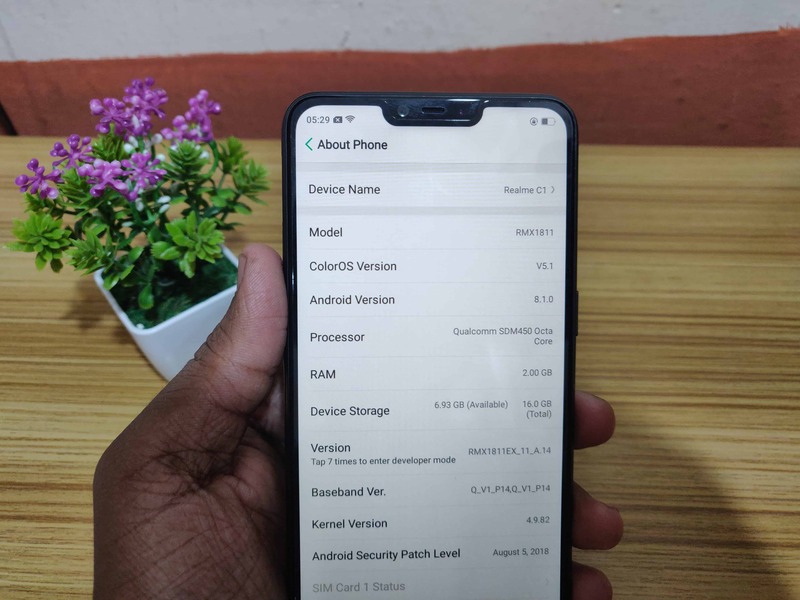 RealMe a sub brand of Oppo they introduced a RealMe 1 mobile with AI support and they launched RealMe 2 & in last month they introduced a midrange flagship mobile RealMe 2 pro & an entry-level budget segment smartphone RealMe C1 the RealMe C1 has comes at the price of Rs.6999 packed with all important features. RealMe C1 a budget smartphone in the box it contains a single variant 2GB of RAM & 16GB of internal memory Smartphone device, a 5V adapter, micro USB cable, SIM ejector tool, protective case, Screen protection film that fixed with the device, warranty cards and quick guidelines about the device. The RealMe C1 comes in a two-colour variant Mirror Black & Navy Blue it builds of plastic material made of 12-layer nanoscale composite material adding a coating of glowing & mirror effect which reflects what ever you show at the back. The design of C1 has on the top they didn’t placed anything and in the left a power On & Off button, at the bottom speaker, micro USB port, 3.5mm headphone jack are placed, in the right volume up & down keys and SIM slot is given, the slot has Dual-Nano SIM support and an dedicated SD card support expandable up to 256GB storage, in the back at the top left dual camera set up with flash mounted and in the bottom RealMe branding. At the device front side selfie shooter, earphones, proximity sensor placed inside Notch, this device has 2.05mm thickness makes like a bar so holding the smartphone is easy, this is the device I felt made with more thickness than any device in recent smartphones. 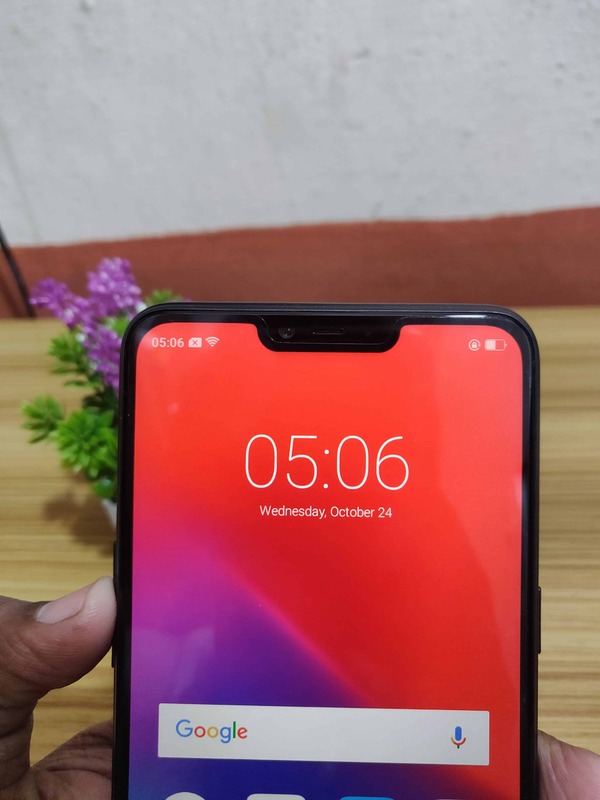 The device has taller size of 6.2 inch HD+ display with 19:9 aspect ratio, it has a 88.8% screen to body ratio and 1520*720 pixel screen resolution, these larger display as a protection of Corning Gorilla glass support and the display as active & attractive bright colours, it has rounded corners on all four sides and at the top it has notch design and minimum bezel at left, right & bottom that makes the device wider & larger view experience while playing games or watching high resolution videos. The RealMe C1 has no support of Show/hide Notch display, so some applications may experience the display-ratio issue with these notch design, but we hope soon these issue is resolved with a software update and this device has eye protection feature that enables the display a cool lighting that reduces fatigue and strain on eye during night sight also, it has adaptive brightness feature that makes the display brightness optimise automatically based on the external available light. RealMe C1 has dual rear camera setup of 13MP sensor with aperture size of F/2.2 & 2MP depth sensor with F/2.4 supports the Bokeh effect. It has a features of AI beauty, Portrait mode, HDR mode, Beauty mode, Consecutive capture mode that shot 20 snaps continuously. The rear camera has a focal length of 3mm and has a better picture in the normal & portrait mode in natural lighting conditions and has a good & faster shutter speed. See the below samples pictures taken in natural lighting conditions in normal & portrait mode. The picture quality in the natural lighting is so much better definitely when a user views the above pictures he decides this device is worth more than the price. But in low lighting & artificial lighting the device tries to gives the output a good colour in the object but you can’t able to get more subject details and while zooming at 2X the subject his became blur and the image has more exposure while taking shots with flashlight. While taking shots in portrait mode in artificial lighting conditions the picture edges are not sharp and having blur at the edges around the objects, but still the picture is good looking only and this device has no support of electronic image stabilization. The front selfie shooter has 5MP with aperture size of F/2.2 has a feature of HDR, Bokeh mode, AF focusing method and it has no front LED flash. It has a support of Full HD video recording support in 1920*1080 resolution at the rate of 60FPS. RealMe C1 is powered by Qualcomm Snapdragon 450 SOC, this chipset is an Octo core processor consists of 8 ARM Cortex A53 cores this is a power consumption core so this device will accumulate power at minimum level normally and this chipset is made of 8 cores so it’s capable of doing some powerful process as well, it works on a clock speed of 1.8 GHz. It has a in build GPU of Adreno 506 that enables up to 25% faster graphic rendering and 30% lower power compared to the SDM 435. The C1 comes in a single variant memory of 2GB RAM & 16GB internal storage in that third party applications are pre installed in the device like Facebook, UC Browser, Daily Hunt, Amazon Shopping, Opera Browser and also, user can delete this application as per their wish, including the all application the user will get only 8.67GB of storage out of 16GB for putting their stuff like application, games, files etc. but for additional storage they provide external SD card support that compatible for up to 256GB memory, but still you can’t able to move all application to SD card if RealMe has a variant for 32GB means that will be good one, moving to RAM the user will get only 800MB of RAM memory after all system usage memories using this memory you run this smartphone for just like for normal user, but for considering the price segment this would be best preferred smartphone for a moderate users. The Night shield protection to prevent your eyes from fatigue and it helps for users who viewing the smartphone for more time. It has a option given for Game space that organise all gaming application inside that space and you have an option in settings> Game space and toggle Graphics acceleration for better gaming experience. Do Not Disturb (Quiet) mode having an option with Auto & Manual. In manual mode user can select the specific application and can choose the from and to time based on their needs. Split screen option for using two application in a single screen. Double tap screen on & Off Feature. Screen pinning option with lock mode that pins the current application running in the screen and to Unpin user needs to authenticate with their passwords, this is another handy feature. AI board in launcher provides better user experience based on your usage activity like favourite contact, recently contacted, recently used apps, weather info, steps tracker, notes, quick functions. Inbuilt application lock with security code and user to set security question while enabling to reset the password in future and application lock is linked with face lock so you can open the application using you face and it unlocks in 1.5 seconds. Google smart lock feature that unlocks device based on your Body detection, Voice match, trusted devices & trusted places. Smart search feature in Phone Dialup. Option to take screenshots by holding Volume down + Power button. RealMe share application that shares files & multimedia to other RealMe mobiles using hotspot connection. Lift up at 30° degree from the flat surface turns on the display & Screen Off in Flat surface features. Smart Driving option enables automatically when you are going for driving that allows incoming calls for some contacts & for same number repeated for 3 times by enabling the option Ring for Repeated calls and other features like Block banner notifications that disable notifications. Screen-Off gestures by drawing specific alphabet to open application instantly while the screen is Off. Misoperation prevention that prevents unwanted operations when the lock screen is covered. Smart call option that attend the incoming calls automatically when you move the device near to your ears. Navigation Gestures with different styles that hides navigation buttons and by using swiping Gestures option from the bottom. Navigation keys inter-changing with different key layout as per user wish & separate key for hide & unhide navigation keys. 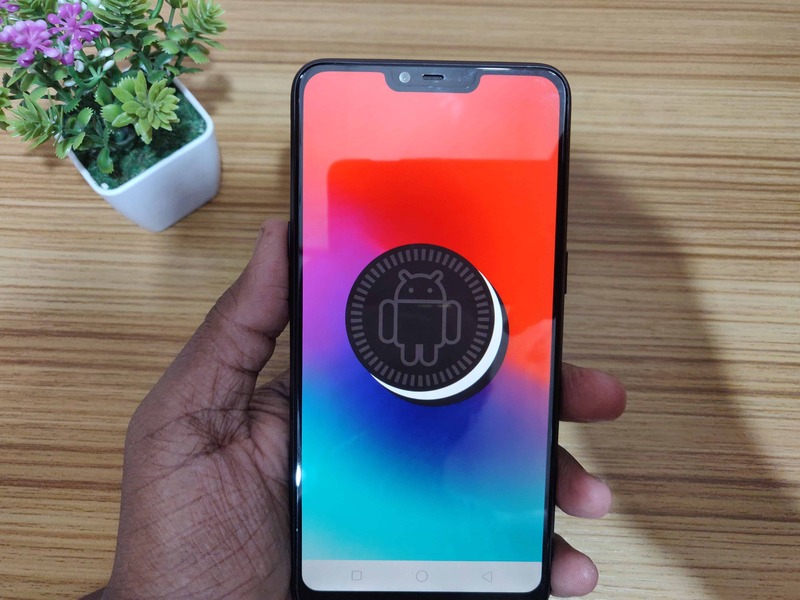 All the above features are tested in RealMe C1 device that gives best user experience and these features are useful in daily activity, C1 customise these additional features using the ColorOS 5.1 operating system. Another highlight option in this device is its Battery, C1 has a larger non-removable battery mounted at the back of the device has a power of 4230 mAh big battery since this device has A53 cores in SOC & AI algorithm used so energy consumption for each service will be optimised based on the user activity and a full charge will give you 1.5 days of battery life if you are more than a moderate user. The Snapdragon 450 processor as a support for 3.0 quick charge option but C1 has no quick or fast charging support, it takes nearly 3.5 to 4 hours of charge to fill the battery. Moving to the security of this device C1 has skipped the finger print sensor due to considering the overall cost but it has face Unlock feature that unlocks the device as fast as 0.3 seconds by just swiping the device also, it supports the lift up display options so the user can just take & swipe to unlock the device using facial pattern with this handy feature and during low light conditions C1 fails to unlock the device at that time you can continue unlock by authenticating via passwords, PIN or pattern also, this device as a support of Google smart lock feature that unlocks device based on your Body detection, Voice match, trusted devices & trusted places you authenticated initially. Bigger display with Notch design. Good Design & easy to handle. No option for hiding Notch design. No Finger print sensor scanning.